A forensic scientist said the odds of DNA taken from Callum Davidson’s garment being from someone other than Mr Donaldson were a billion to one, and could have landed on the t-shirt as drops of wet blood from a weapon being swung. Police near Loch Kinnordy (left) and Steven Donaldson (right). Scottish Police Authority expert Sarah Milne also concluded from investigations carried out at Loch of Kinnordy nature reserve, near Kirriemuir, that blood trails found there were consistent with Mr Donaldson running through the car park, being attacked near its entrance and then dragged back to his car before being hit again prior to it being set on fire. The trial’s eighth day heard the handlebars of Davidson’s mountain bike and part of a broken baseball bat also contained blood DNA from the deceased, as well as Davidson. Under questioning by advocate depute Ashley Edwards, the witness spoke about blood found along the edge of the car park, which she concluded could have been consistent with dripping from someone who was bleeding. A pool of blood and a piece of tissue was found on the road at the entrance to the car park, as well as blood on the grass verge there. 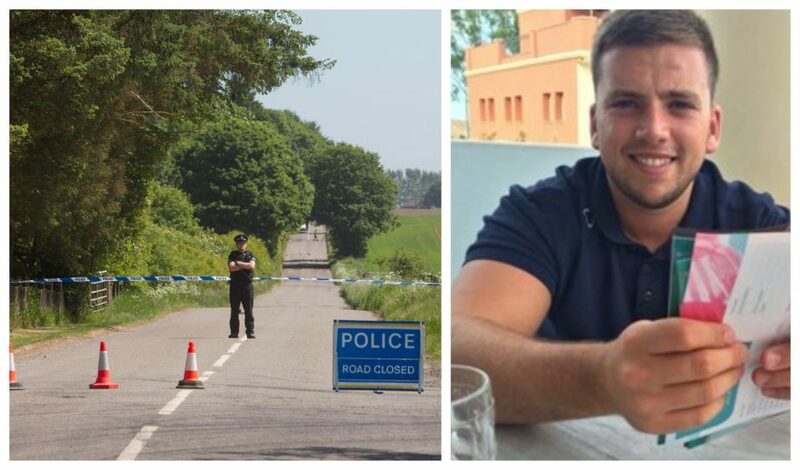 The witness then said there was a “drag mark” of blood from a heavy area of staining at the entrance and through the middle of the car park to beside Mr Donaldson’s burnt out BMW at its far end. All of the blood samples matched the DNA profile of the deceased, the court heard. A laboratory examination of Davidson’s t-shirt revealed the blood spots at its base, which the witness said may have indicated something else was being worn over the top of it. The advocate depute asked if the spots could have come from a weapon, to which the witness replied: “Yes”. Jurors head the forensic report suggested a possible explanation that the blood may have come to be on the t-shirt if Davidson had used the baseball bat while repeatedly striking Mr Donaldson as alleged. The trial also heard from consultant neuropathologist Dr William Stewart, who said an examination of Mr Donaldson’s brain had revealed bleeding around it consistent with a direct impact of reasonable force. He said the signs were “absolutely typical” of being struck by an object. The organ was also examined for indications of neurological changes which might indicate how long Mr Donaldson had survived from the time the brain injury was sustained to the point of death and the witness said it was “short”, probably less than an hour. The charge faced by the accused Steven Dickie, Callum Davidson and Tasmin Glass alleges that between June 6 and 7 2018 at the Peter Pan playpark, Kirriemuir and Loch of Kinnordy nature reserve car park, they assaulted Mr Donaldson and arranged to meet him with the intention of assaulting him, and once there repeatedly struck him on the head and body with unknown instruments whereby he was incapacitated, and thereafter took him to Loch of Kinnordy where they repeatedly struck him on the head and body with a knife and baseball bat or similar instruments, repeatedly struck him on the head and neck with an unknown heavy bladed instrument and set fire to him and his motor vehicle, registered S73 VED, and murdered him. Dickie and Davidson face four other charges including one of behaving in a threatening manner towards two men between January 2014 and June 2018 by making threats, following them on foot and in a motor vehicle, presenting weapons and acting in a threatening manner. They are also charged with putting a kitten in a bag in Main Street, Lochore, Fife on an occasion between February 1 and May 31 2017, swinging the bag about and punching and kicking the kitten; behaving in a threatening manner towards a man in St Malcolm’s Wynd, Kirriemuir and elsewhere between December 1 2017 and February 28 2018 by following him on foot and in a vehicle, and threatening him with weapons. Davidson faces a further charge of assaulting a man between June 1 2017 and December 31 2017 at a house in Glengate, Kirriemuir by pushing him to the floor and threatening to punch him. Dickie is also accused of assaulting a woman at the Ogilvy Arms pub in Kirriemuir between February 1 and 28 last year by seizing her by the wrist and neck and threatening her with violence.